What to know before you go: licenses, clothing, food & drinks, seasickness prevention, weather. Click here for the info! Sooke's year-round salmon fishing is legendary! Anglers come from all around the world to chase Vancouver Island's mighty Chinook, the largest species of Pacific salmon. Once hooked, Chinook put up a powerful fight, with long reel-screaming runs. October-June. Troll deep (120-150 feet) with hootchies, squirts, or anchovies for winter springs. These fish feed year-round off Sooke and provide salmon fishing opportunties all year long. While smaller than summer spring salmon, winter springs are very tasty "barbecue fish". Coho are the most acrobatic and energetic fighters of the salmon species. August-October. Troll close to the surface, usually with spoons or hootchies. These fish are found in deeper water outside of Sooke, in the second or third tidelines. Sockeye are considered the best quality table fare of BC's salmon species. July-August. Subject to limited openings. Troll in deeper water with hootchies. Pinks are scrappy surface fighters. When you get into a school, it can be non-stop fishing action, with double-headers and triple-headers common...and even quadruple-headers, if you can handle that many lines in the water! July-August, only in odd numbered years. Troll with hootchies or spoons, jig with buzzbombs, or pretty much anything...these fish are not picky eaters. Halibut: the best white meat fish money can buy, plus a lot of fun to catch! While not too many anglers target Halibut right off Sooke, there are regularly small halibut caught on salmon gear when fishing deep. Every once in a while some lucky angler catches a "barndoor" halibut bigger than 100 pounds. 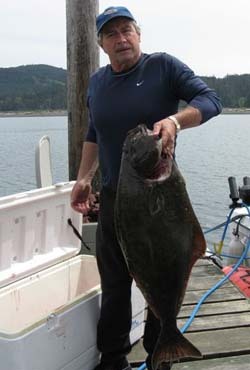 There are excellent halibut fishing grounds a 20-30 minute boat ride from Sooke. 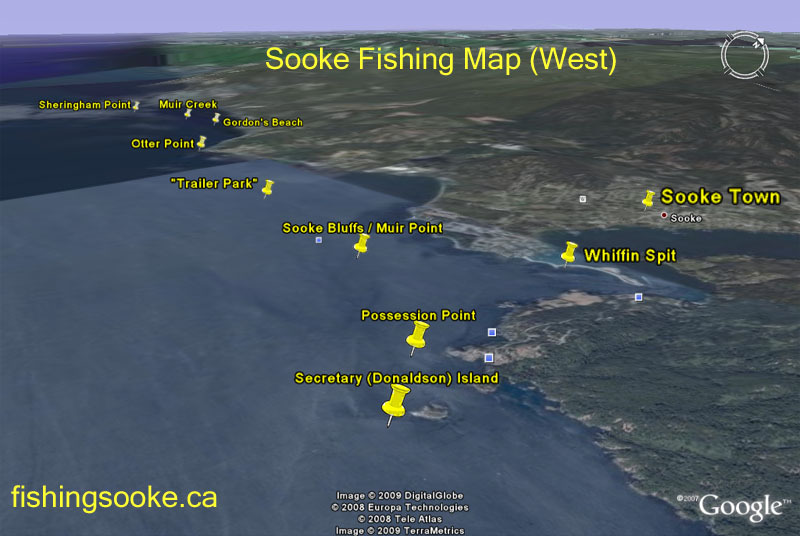 Rockfish: Sooke has a number of spots that anglers can target rockfish. 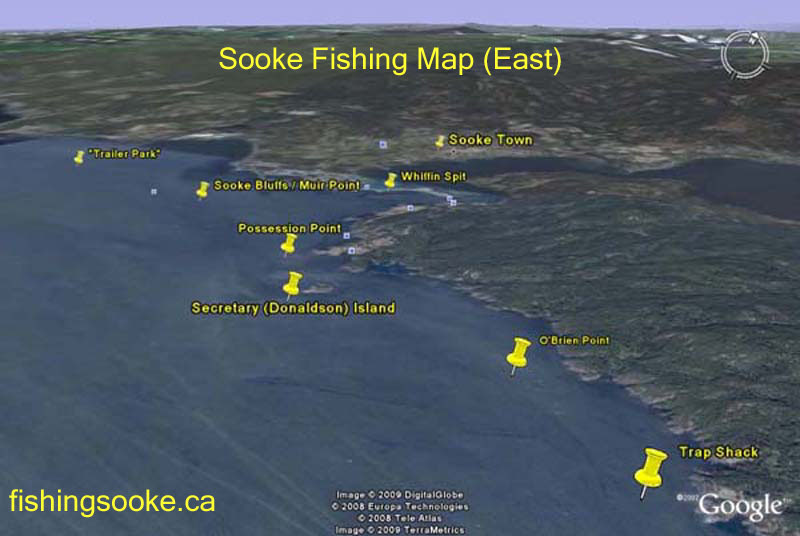 Possession Point: the closest spot to Sooke Harbour, a 5 minute run from the end of Whiffin Spit lighthouse. Big Chinook salmon! Secretary Island: also called Donaldson Island, 200 metres into Juan de Fuca Strait from Possession Point. Big Chinook salmon! Outside of Secretary is typically the starting point for coho, sockeye, and pink fishing in summer. Trap Shack: 10 minute run towards Victoria, off East Sooke Park. 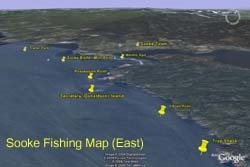 Otter Point: considered by many to be the "crown jewel" of Sooke fishing. 15-20 minute run west from Sooke. 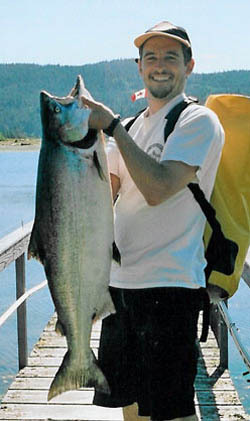 Trophy Chinook salmon, July-Aug.
Sheringham Point: 25-30 minute run west, trophy Chinook. 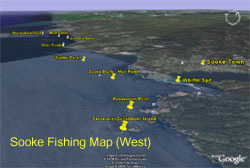 Point-no-Point and Jordan River: 45-60 minute run west, halibut fishing March-June. I guess you could say that I caught the fishing bug early in life. It began when I was still in the crib, with Dad's tales of big silver salmon landed, and of course the HUGE tyees that got away. As an experienced guide I am happy to share proven techniques for catching fish in our local waters with all anglers, from kids to seniors and novices to experts. I look forward to opportunities to display the beauty of our unique marine environment and share some Island hospitality. -- John Rogers, Sooke, BC, "Jolly Rogers Fishing Adventures"